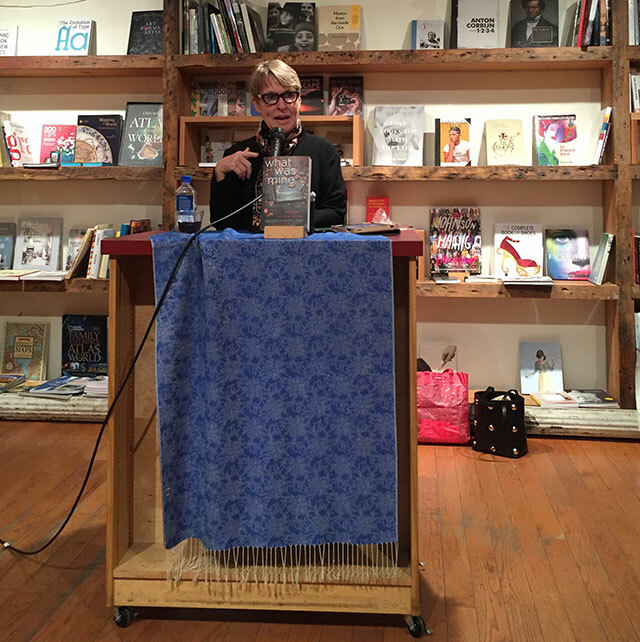 Helen Klein Ross was at BookCourt last week to read from her new novel, What Was Mine, about a woman who has stolen a baby girl and raised it as her own. The novel started off as a short story sent to The Atlantic Monthly. There an editor suggested it wasn’t really a short story. It was too complex and actually a compressed novel. Ross took the short story to her writing workshop where it grew. “Without a workshop, I probably wouldn’t have a novel,” she says. She likes writing workshops primarily because it creates urgency. The weekly deadlines are difficult to skip. The idea of the plot grew out of her own fear. Ross says she worried about someone stealing her own children. She imagined how easy it would be for someone to sneak off with one of her daughters in New York City. The novel required research, enough that Ross says she was surprised by how much was required for writing fiction. She spoke to many people, first about infertility and then later to an FBI agent about kidnapping cases. The agent described to her what would happen in the hours after a child initially disappeared and the necessary things to happen for the kidnapper to escape. The most common way for a child to disappear is for them to walk away with a stranger. Having a password the child has memorized is a helpful way for preventing this kind of kidnapping. “Research can only go so far,” Ross warns. Fiction must also come out of life. There are many characters in the novel who offer a point of view — fifteen characters voice the narrative. Partly this comes from Ross’s realization in the transition from story to novel that not every character would know the whole story. Her first attempt at filling in these plot holes was through emails. That didn’t work. Eventually she began writing the novel without having a character in mind. She group together snippets of text and then combined them later after deciding on a character to voice that portion of the story. Initially she thought the novel was a story about two mothers. Eventually her editor made her realize the importance of adding a voice of the daughter, and how essential she the daughter was as a character. The daughter gave the mothers more dimension. “Without kids, we aren’t mothers,” she says. “I think we are all capable of anything given the circumstances,” she concluded.